100 neighborhood kids won supplies they will need when returning to school this fall. 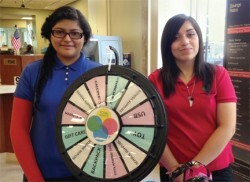 Shown with the prize wheel are volunteers: (L to R) Ashley Castaneda and Vanessa Gaytan. Prizes were part of Community Savings Bank’s annual “Back to School” celebration held before the start of schools in Chicago. Community Savings Bank held its annual “Back to School” celebration in its main lobby before the start of schools in Chicago for kids age 15 and under. About 100 neighborhood kids attended and were invited to enter to win supplies needed to go back to school this fall. Each child gave the prize wheel a spin to win a Target gift card, school supplies, tote bags, USB flash drives, calculators, back packs and other school related items. Kids enjoyed juice and treats during the event.